My first contact with safety footwear was when I became employed at the iron and steel making complex in North Lincolnshire. This was in 1975 and the world was a very different place then. The Health and Safety at Work act 1974 had just been implemented and the full impact of how this would impinge on the workplace was yet to be absorbed by many. Even back in those days we were supplied with safety footwear in the form of work boots with steel toecaps. I recall going along to the stores with the slip of paper my supervisor had given me and I had carte blanche with regard to the various forms of safety footwear that were available in the stores. There was even a pair of leather clogs with wooden soles – these had iron cleats hammered into the wood. I never really did know what these were about as working in the aggregates and slag section they were not really suitable with regard to my work role. I didn’t know it then, but I would be wearing safety footwear in one form or another continuously for the next 27 years of my working life. In all that time we never had an issue with the supply of safety footwear to employees. The need for supplying footwear of the correct type to employees was never questioned as this was high risk employment, and the hazards and risk factors regarding the potential of damage to employees’ feet was well known. Later, I would be involved in the selection of footwear and PPE that we supplied to our workforce to ensure it was fit for purpose. I still wear safety shoes with steel toecaps occasionally now, but only for on-site visits. The decision to supply safety footwear should come from completing a risk assessment of your workplace and the activities that are carried out there. The Health and Safety at Work Act 1974 clearly states that employers have to provide a safe working environment. In addition, the Management of Health and Safety at Work Regulations 1999 requires employers to conduct a suitable and sufficient risk assessment of workplaces and work activities to ensure the health and safety of their workers. If any hazards are found then they must be removed wherever possible, or control measures introduced in order to reduce the risk as far as practicable. Any workplace risk assessment must consider hazards such as slippery floors, the dropping of heavy or sharp objects onto the feet, walking on hot surfaces, the presence of acids, solvents, oils, or sharp objects on the floor, or electrical hazards. Any safety footwear should inherently have characteristics that protect against these hazards. The Personal Protective Equipment at Work Regulations 1999 state that if a risk has been identified and cannot be eliminated, or a suitable control measure found, then protective equipment must be provided. This includes footwear. If an employer provides protective equipment, such as footwear, then it must be provided free of charge and there must be instructions on how to care for and use it safely. The fact that The Personal Protective Equipment at Work Regulations 1999 state that PPE and therefore safety footwear should always be issued as a last resort is not always apparent to employees. This is due to the issue of safety footwear being seen as routine. To help alleviate this confusion it is a good idea to ensure your employees see both risk assessments and policy documents. A well thought out and comprehensive policy regarding your approach to PPE and the use of it is vital in helping to secure the cooperation of employees. This along with allowing employee involvement in selection is the key to the successful implementation of safety footwear. Some companies allow a choice in the type of safety footwear their employees wear. If this is the case in your company then it should be remembered that any footwear selected should meet the requirements of the risk assessment, and it is your responsibility to see that this happens. Some companies also set a limit on the cost of safety footwear. This is often in the region of £30-£40. They then allow the wearer to add to this amount from his/her own money should he or she wish to have safety footwear of higher quality, or of a different style. Again, if this is the case then you also need to ensure that the footwear meets the requirements of the risk assessment and is appropriate for the kind of work that is carried out in your workplace. An example of this is where an employee wants a particular brand or style such as safety footwear in the style of a trainer. It is important to ensure that any safety footwear purchased is suitable for the task for which it is intended. Any protective equipment, including safety footwear provided by an employer, should meet European standards. 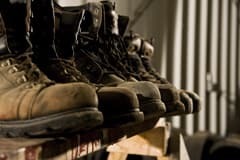 There are various standards for footwear, including one for safety footwear, another for protective footwear, and a third for occupational footwear. Any footwear that is being supplied must be certified and stamped with the CE mark. To ensure footwear is going to fit correctly it is wise to consider the recommendations, right, in the fitting section. This is especially true if the person the footwear is intended for has leg or feet problems. Feet bear the brunt of the daily working life and standing, badly fitting footwear, slippery surfaces and falling objects are just some of the dangers to which we expose our feet in the workplace. It is estimated that around 80 percent of the adult population has some form of foot problem. This can vary from aches and pains, swelling and corns to fungal infections and varicose veins. While not all of these are a result of work activities, work can play a part in exacerbating some of these conditions. The biggest risk often comes from slips and trips. After all, slips, trips and falls account for around 50 percent of accidents in UK workplaces. These can be caused by inappropriate footwear, although frequently the problem is not just with the footwear but the actual floor surface. Employers should make sure that floors are kept clean and dry and, where that is not possible, special flooring may need to be installed. If slips are a concern then there is a whole host of slip resistant footwear on the market. Sole descriptions are varied and can be confusing. Terms from ‘improving the grip performance’ to ‘excellent multidirectional slip resistance’ are common. Often, footwear is just described as ‘slip resistant’ and sometimes brochures do not describe the conditions for which the footwear is most suitable. It is therefore advisable to choose a good supplier that has a comprehensive understanding of safety footwear. With safety footwear, like any product, you get what you pay for. Ensure you buy footwear that will do the job – this will not automatically be the cheapest, but it may be more comfortable or attractive. This can help to ensure that employees will wear it. Giving some choice on styles if possible is also a good idea. Consider surfaces and contaminants which cause slip risks in your workplace, and seek your supplier’s advice on suitable footwear. Some generally slip resistant footwear may not be suitable in specific demanding conditions. For example, footwear that performs well in the wet might not be suitable on oily surfaces, or where there are sticky food spillages that clog up the cleats. A good tip is to ask your supplier to provide trial pairs to help you make the right choice, and not to select footwear on the basis of brochure descriptions or laboratory test results alone. It’s a good idea to have both feet measured because they may not be the same size. When choosing safety footwear, the length, width and depth of the footwear are important. Always try on both shoes or boots. Make sure there is enough room at the front of the shoes to allow for the natural movement of your toes when walking – your toes should be able to wiggle. Make sure there is around 1cm space between your longest toe and the end of the footwear. Failure to adhere to this can lead to extreme discomfort of the toes and blackened toenails though bruising. When choosing new footwear, take time to test it out, and walk around to ensure maximum comfort. Footwear that fits well should feel comfortable. A good fit doesn’t necessarily mean high expense. In addition to ensuring that the safety footwear meets the required legal standards it is also important to make sure that it is comfortable. You should be aware of the following points. The Uppers should be made from natural materials such as leather or a breathable, manmade fabric. Some leather has a plastic coating to repel water and allow the shoe to be wiped clean. The Lining should be made of a breathable material to keep the foot fresh. Linings need to be smooth and seam-free with no hard or sharp edges. The Insoles should preferably be removable to allow the easy insertion of padded or specialist insoles. Employees who suffer from plantar fasciitis, more commonly known as policeman’s heel, will need to be able to insert their own insoles. The condition plantar fasciitis is on the increase. It was at one time associated mainly with people over the age of 40. The condition plantar fasciitis is inflammation of your plantar fascia. Your plantar fascia is a strong band of tissue, like a ligament, that stretches from your heel to your middle foot bones. It supports the arch of your foot and also acts as a shock absorber in your foot. As you age it becomes worn or degraded. The condition is on the increase due to more and more people wearing flip-flops. This type of footwear offers no support to the foot and causes damage to the plantar fascia. Doctors are now seeing a rise in the reporting of this condition affecting the under Thirties. The Heel end of the footwear should fit snugly on the foot, stopping the heel slipping out of the shoe and stabilising the foot upon ground contact. The heel should have a broad base and be no higher than 4cm. If worn for long stretches they should be no more than 2cm in height. Soles should be strong and flexible with shock absorption to cushion the jolts of walking on hard surfaces. The material of the sole should be slip resistant, such as rubber, polyurethane or PVC. Fastenings can be laces, buckles or VELCRO to secure the foot in the shoe. This is a common type of safety footwear that is found with a covering around the toe area and is capped with a material to help keep the toes protected from accidents. Although traditionally the toecaps have been made of steel, the reinforced area can also be made of a composite material, a plastic such as thermoplastic polyurethane (TPU) or even aluminum. Steel inserts are used to help keep the foot protected from common joint problems. Those people who are employed to ride bikes, push pedals and drive heavy trucks could suffer from such foot issues. These shoes help to keep the foot stabilised and prevent it from shifting and moving around too much, in turn preventing joint and bone problems. It is also one of the most comfortable types of safety footwear. This type of safety footwear ensures that the feet are protected from all external injuries, accidents and harmful objects. This type of safety footwear has been designed specially to protect and safeguard the feet from sharp and pointed objects like nails, glass pieces and other metal objects. People who work in large industrial factories that are involved in the manufacture of machinery and glass objects usually wear this type of safety footwear. It helps in preventing these sharp objects from penetrating to the feet, causing injury or harm. These shoes are special safety shoes that have been specifically designed and created to protect the upper part of the foot and bones. They help to reduce and prevent injuries from accidents that can happen due to heavy equipment falling or dropping down on the feet. These safety shoes are made to protect the feet internally as well as externally. They also safeguard the toe area. These are usually worn on construction sites or for jobs that involve the lifting of heavy equipment and machines. Employees who work with electricity, circuits, wiring and high voltage machines and devices wear this kind of footwear. It is constructed with a sole that helps reduce the potential of any employee receiving an electric shock when exposed to high voltage circuits and electricity. The importance of proper footwear goes further than just appropriate safety footwear. In fact it is important that all employees are encouraged to wear ‘sensible’ and appropriate footwear, even if safety footwear is not a required in their work role. The Personal Protective Equipment at Work Regulations 1992 is based on European Council (EC) Directive 89/656/EEC requiring similar basic laws throughout the European Union on the use of PPE in the workplace. The Personal Protective Equipment Regulations 2002 (SI 2002 No 1144) implements into UK law the provisions of the Council Directive 89/686/EEC. It lays down the conditions governing Personal Protective Equipment (PPE) placed on the market. The free movement within the Community and the basic safety requirements that PPE must satisfy in order to ensure the health, safety and protection of the user.